As recently as 1998, the wild loggerhead shrike population had reached a low of 14 individuals. This was mainly due to sheep, cattle, and goat ranching that damaged San Clemente Island’s unique maritime sage scrub habitat from the mid 1800’s through 1934, at which time the island became a U.S. Navy training base. The sheep and cattle left the island with the ranchers, but the feral goat population remained and reproduced, and by the 1970’s the island had over 12,000 goats. After a huge effort by the U.S. Navy, the last goat was removed in 1994. 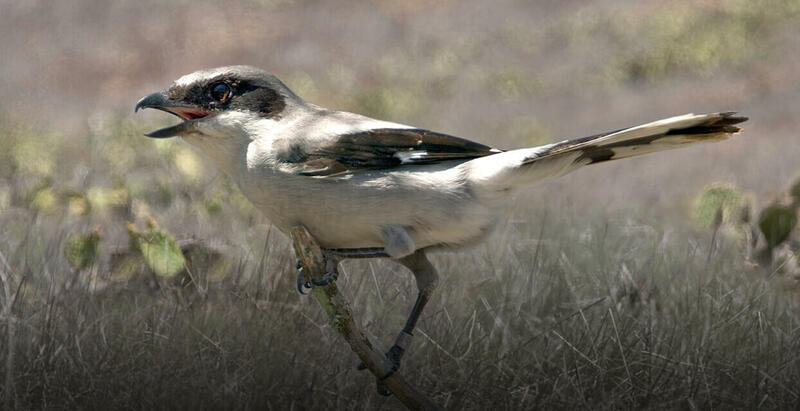 Because the wild shrike population was so near to extinction, San Diego Zoo Global established a safeguarded population in 1991 by removing eggs from wild nests for artificial incubation and hand rearing. From these first successfully reared birds, a breeding population was established. This population functions as a safety net in case the San Clemente loggerhead shrike is again threatened with extinction and provides individuals for release to augment the wild. The breeding and release program has been critical to population sustainment in the wild. From 1992-1996, we successfully grew our population, but none of the shrikes that were released survived to become part of the wild breeding population. In order to improve our release and breeding protocols, we changed our juvenile releases to imitate the natural dispersal of juvenile shrikes from their natal territory. We developed a new release protocol involving breeding pairs in field aviaries and releasing the family once the chicks were free flying. We shifted from mainly hand rearing to mainly parent rearing, resulting in young shrikes that were more wary and behaviorally closer to wild shrikes. As a result, some of the young shrikes released in 1999 survived and bred in 2000. Besides breeding healthy, wary shrikes, we also carefully managed the genetics of our flock, carefully selecting who bred with whom, guided by our studbook. Once the wild population began to steadily grow, our Recovery Ecology and Conservation Genetics teams began to manage its genetic diversity as well by selectively breeding and releasing birds from lineages rare in the wild. Thus, the current population of wild breeding shrikes is also more genetically diverse. While we have been busy breeding shrikes, our partners have been assisting the recovery of the island’s habitat by planting shrubs and trapping introduced predatory cats and rats to enhance shrike habitat on San Clemente Island. All San Clemente loggerhead shrike recovery actions are funded and overseen by the U.S. Navy.